It is hosted by Godaddy.com Inc (Arizona, Scottsdale,) using Apache web server. It has 2 DNS records, ns44.domaincontrol.com, and ns43.domaincontrol.com. 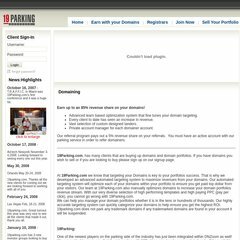 19parking.com's server IP number is 68.178.254.124. PING (68.178.254.124) 56(84) bytes of data. The server is slower than 93% of measured websites, at 638 milliseconds. Also a time of 60.1 ms, is recorded in a ping test.